Attract and evaluate the ultimate leader for your team. When discussing inside sales leadership, everyone thinks: "If you can't measure it, you can't manage it." But too few remember the flipside of that coin: "You manage things. You lead people." 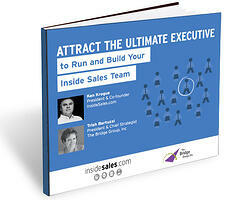 Inside Sales veterans, Ken Krogue and Trish Bertuzzi, share how to attract, evaluate and hire the ultimate executive to lead your Inside Sales organization.